Mountainous areas in general or Lao Cai Province in particular are usually well known for its tranquility thanks to the geographical location together with the amazing and gorgeous landscape that our Mother of Nature has given to those places. Besides, what makes them so attractive to most of tourists when coming to visit Vietnam is about lives of people, especially of the ethnic minorities. The peaceful and quiet life sometimes is lighted out and stood out by some activities occurred once a week. Among all of them, Bac Ha Market is an event that tourists would never neglect if having chances to visit Sapa. Located about 65 km from Lao Cai train station or 80km from Sapa town, Bac Ha is a remote district of Lao Cai province. 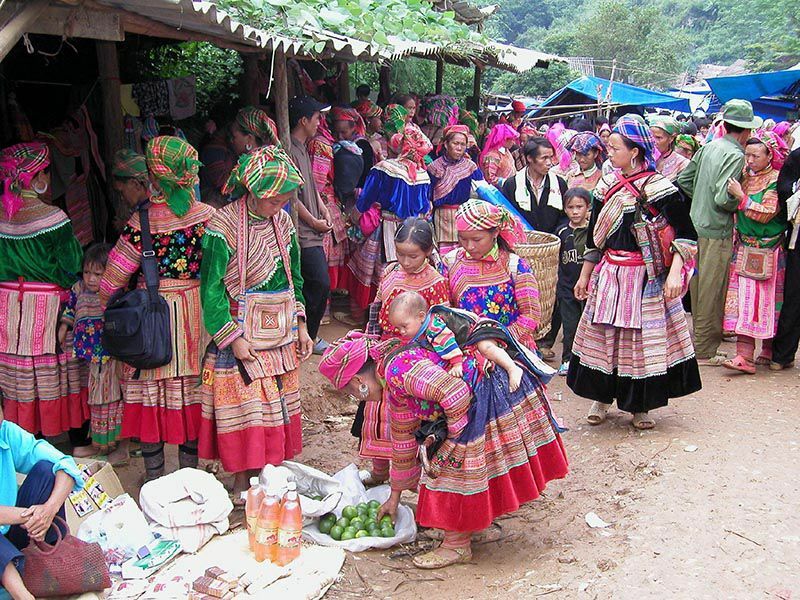 One can reach Bac Ha market by renting a car or tour from Sapa, which is about 3 hours away. Despite being surrounded by countryside just as lush and interesting as Sapa, Bac Ha has somehow flown under the radar as a trekking base so far. In town, woodsmoke fills the morning air, the main street is completely bereft of hawkers, and chickens and pigs snuffle for scraps in the back lanes where a small clutch of traditional adobe houses valiantly clings on in the age of concrete. Sleepy Bac Ha wakes up for the riot of color and commerce that is its Sunday market, when the lanes fill to choking point and villagers flock in from the hills and valleys. Once the barter, buy and sell is done and the day-tripper tourist buses from Sapa have left, the town rolls over and goes back to bed for the rest of the week. Bac Ha Market is not simply a place for buy and sell but also an opportunity for people from different ethnicities to come and meet, for relatives to reunite after a long time missing, for women to demonstrate their beautiful handmade traditional costumes and even for youngsters to find their dates. To reach the market, many ethnic vendors have to walk a long distance passing mountains and hills. 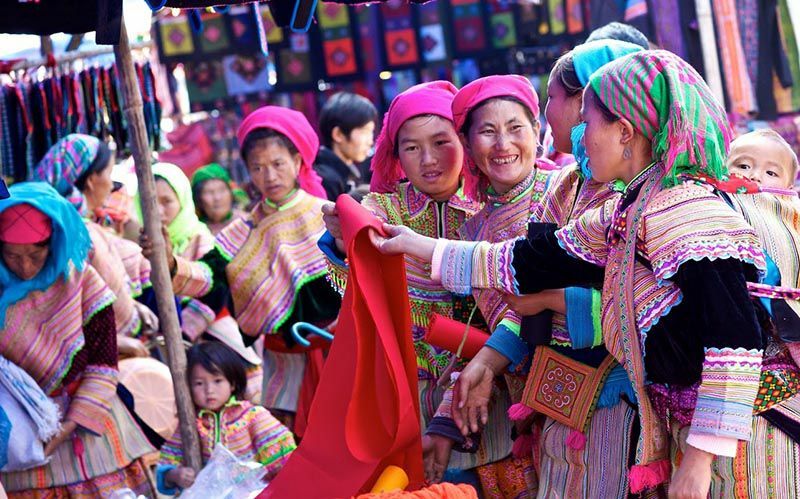 Yet the distance has never discouraged them from joining the Sunday colorful Bac Ha market. Having to say, Bac Ha Market is the biggest minority peoples market in Northwest Vietnam. Alive with the bright colors and extravagant costumes of the local people, here you will meet Flower Hmong (Red Hmong), Black Dao, Tay, Nung, La Chi, Phu La and other minority groups who come from far and wide to buy and sell a wide variety of goods and livestock, to exchange news and to renew friendships. 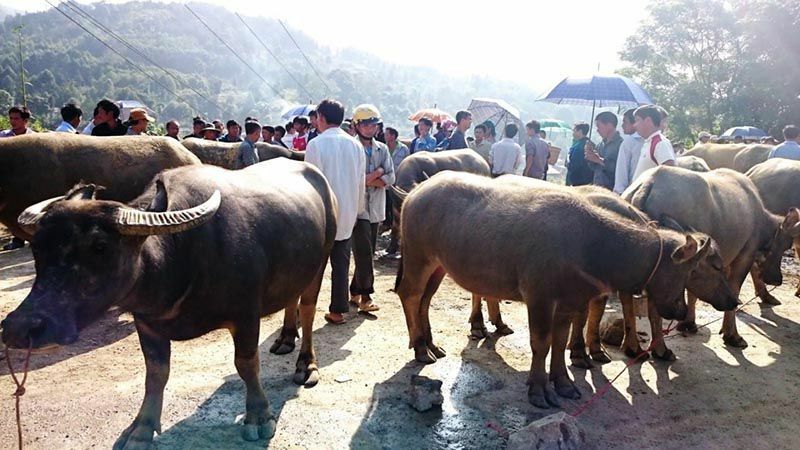 In the past the market was a center for trading horses but now that motorbikes have replaced them it is more common to see buffalo, cows, goats, fish and other livestock being traded. The market opens at around 7.30am and closes mid-afternoon, so an early start is advisable. The main square where trading takes place is divided into smaller section, specializing in a particular product such as handicrafts, food, horse, poultry and blacksmith. Each has its own trait and worth joining. The town itself is rather dull for any country surfer but if you want a relaxing place to get away from the tourist crowd in Sapa, or simply fond of taking unique photos, Bac Ha can be your option. You can book a day trip to Bac Ha market from Sapa on Sunday, or plan tours to Sapa from Hanoi to include the trip to Bac Ha market. When it comes to Sunday, lives of people living in Bac Ha are amazing interesting and exciting. When it passes, they come back to their daily routine peacefully and smoothly. Whatever it is, people living there are still friendly, kind and helpful and they are still trying to preserve one of the most unique feature of their traditional custom. Tourists would be highly recommended to visit those remote but attractive village to explore the beauty deepen and hidden by the nature.